Get four of our most essential tools for fixing problems that would otherwise ruin a recording. Reduce background room noise, amp hiss, and other ambient issues with Voice De-noise, fix distortion caused by clipping at your mic preamp with De-clip, take out ground hum and other tonal noise with De-hum, and handle clicks, pops, and other artifacts with De-click. With RX Elements, high quality production audio is now within your reach. Repair Assistant - Representing the latest advances in iZotope's assistive audio technology, Repair Assistant is a game-changing intelligent audio repair tool that can detect noise, clipping, clicks, and more. 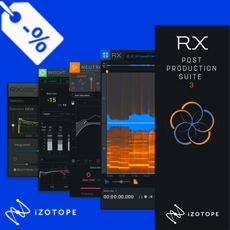 RX Audio Editor standalone application - Visually identify audio problems with the spectrogram view then use familiar image editing tools to fix the issue. Voice De-noise - Finely tuned for vocals and dialogue, reduce unwanted steady state or evolving background noise like refrigerator hum, air conditioning noise, and amp hiss. De-click - Clean up vinyl clicks, mouth noise, and soften up clicky bass guitars with the new low latency De-click algorithm.